On this page you find a complete list of all the EDGE Packages currently being offered. The package descriptions provide the details of each package, and the picture will give you a preview of some of the items included. The EDGE Packages listed towards the top include everything you need to get disc golf in your school. Whether you need an easy to set-up temporary course or a permanent course installed on school campus, we have the package for you. If you already have a course on campus, the two packages at the bottom of this page are for you. If you have any questions regarding the EDGE Packages, please feel free to contact us. To place an order please call, 1-866-391-3343. Please take a look at the EDGE Comparison Chart. This is a quick reference guide that will help you pick the EDGE Package that meets your needs. Click the image to see the Different EDGE Package components. Suitable for introductory play, indoor use, or for itinerant teachers that need an easy-to-transport setup. Includes the EDGE curriculum package, Getting the EDGE DVD, 4 collapsible portable disc golf targets, 50 lightweight golf discs, 50 mini-marker discs, 5 Ultimate discs and a Edgebee® set. Easy to store, this package can be used to set up a nine hole course, accommodate large class sizes, or run several parallel SkillShot events. Pricing includes customized discs with school logo. Includes the EDGE curriculum package, Getting the EDGE DVD, 9 collapsible portable disc golf targets, 60 lightweight golf discs, 60 mini-marker discs, 5 Ultimate discs and a Edgebee® set. Featuring INNOVA’s lightweight Sport model basket, this package can be used to set up a temporary tournament style course or a high level SkillShot competition. Pricing includes customized discs with school logo. Includes the EDGE curriculum package, Getting the EDGE DVD, 9 INNOVA DISCatcher Sport disc golf targets, 50 driver golf discs, 50 mid-range discs, 50 putters, 50 mini-marker discs, 5 Ultimate discs and a Edgebee® set. Intended for those schools that want to install a park quality course, this package features the industry standard in tournament targets. The 20 competition disc sets offer students disc choices for use in interschool or intramural competition, as well as providing discs for class instruction. Includes the EDGE curriculum package, Getting the EDGE DVD, 9 INNOVA DISCatcher Pro disc golf targets, 3 collapsible portable disc golf targets, 50 lightweight golf discs, 20 competition disc sets (disc bag with 2 drivers, 2 mid-range, 1 putter, 1 mini-marker disc, 1 bag, 1 towel, and a PDGA rule book. 5 Ultimate discs and a Edgebee® set are also included. Pricing includes customized discs with school logo. 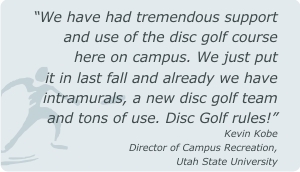 Already have a Disc Golf Course? Intended for schools that already have a disc golf course. This package includes the EDGE curriculum package, Getting the EDGE DVD, 30 lightweight golf discs, 30 mini-marker discs, 5 Ultimate discs and a Edgebee® set. This package includes the EDGE curriculum package, Getting the EDGE DVD, 100 custom imprinted golf discs (a variety of driver, mid-range, and putter), 30 mini-marker discs, 5 Ultimate discs and a Edgebee® set. * All package prices include the cost of shipping in the continental US. If you are unfamiliar with disc golf, an In Service Training session with the EDGE Staff is perfect to get you started teaching disc golf safely. Training sessions can be half day, full day, or week long seminars. We will work with you to make sure that you have the In Service Training that you require. For more information, please click on the following: In Service Training.